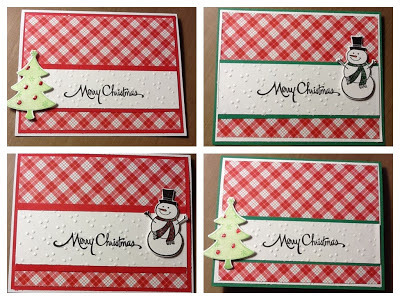 The Christmas cards have been made and mailed out. Hubs contributed to the process by writing the family letter and addressing cards for his side. My contribution was making the cards and addressing my side. I think I got the easier task! I love cardinals, I think they are gorgeous birds. I had never seen one in person until visiting Hubs in Maryland. So I became obsessed with having a cardinal on this year's holiday card. I am happy to say that 50 cardinals (made up of 7 pieces) later I still love cardinals! I spent a lot of time with my punches in the construction of these cards. 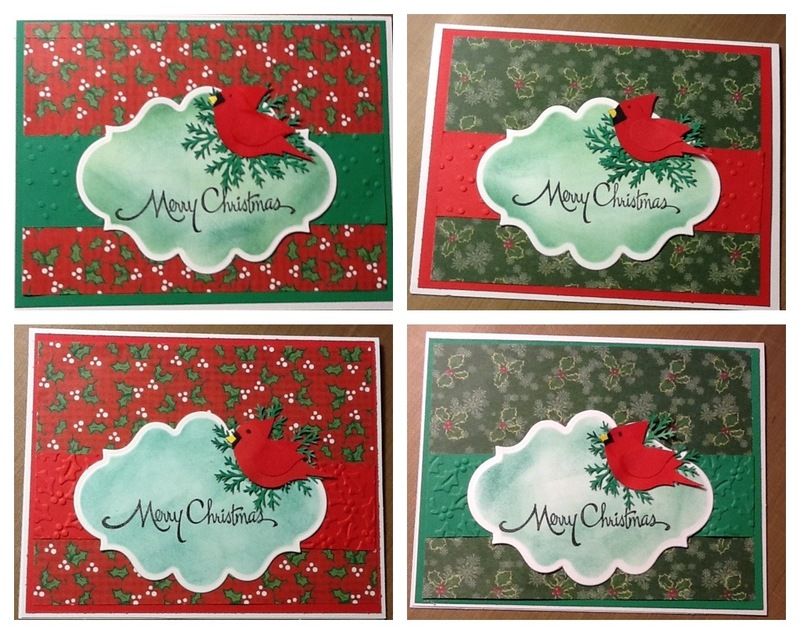 I started assembling the birds first, next the pine branches were punched out, then the sentiment panel was stamped, embossed and inked,next up the dry embossing strips, and finally the patterned papers and cardstock panels. There were originally two versions of the card, until I put together some of them with the wrong color combinations...now there are 4 versions. Thanks for stopping, wishing you and your families the best of the holidays with a new year filled with health and happiness. Our niece and nephews each get their own Christmas card separate from the family cards. 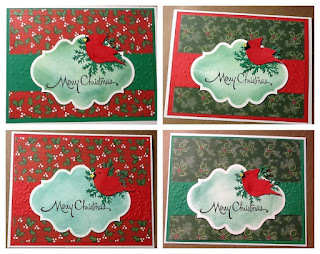 I had found some green and red and white patterned paper that I though would be fun for their cards. Patterned paper, stamps and dies from Hero Arts, sentiment from Stampendous, embossing folder from sizzix. I am so not ready for my holiday celebrations. 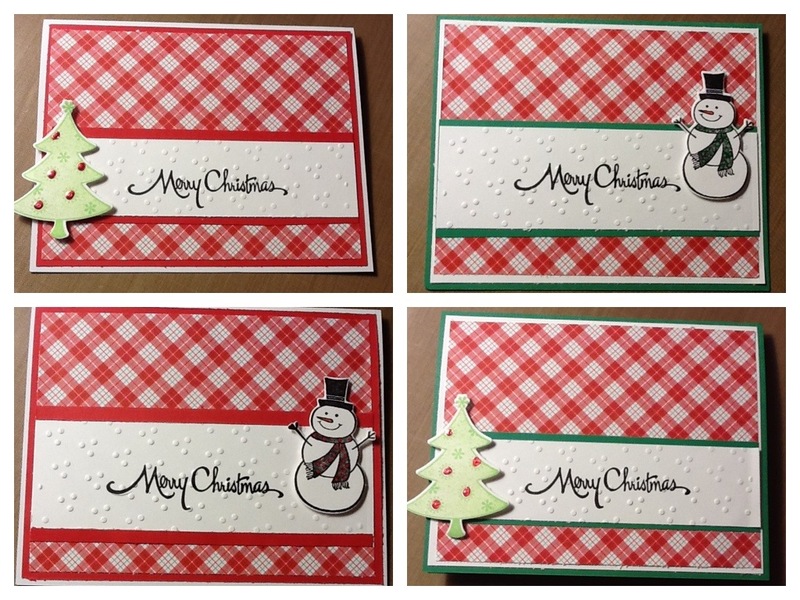 I just barely got my Christmas cards mailed off, I will post them early next week. I decided to make some gift tags. I made two sets, one in Silver and one in Gold. I used the curling ribbon because I love the nostalgic feel of it. It really reminds me of my childhood Christmases. I used patterned papers as the background on two of the tags, stamps used were from Hero Arts and Stampendous, Versamark embossing ink, and Stampendous embossing powders, the tags were from my LSS. It is very difficult to show the lushness of the silver and gold embossing in the photographs. 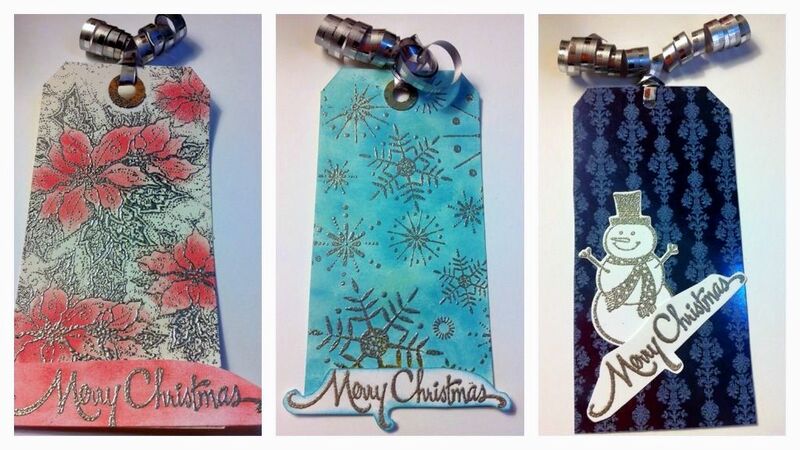 The tags are also big, 2.5 by 5 inches. I have some large pre-wrapped boxes they will compliment. 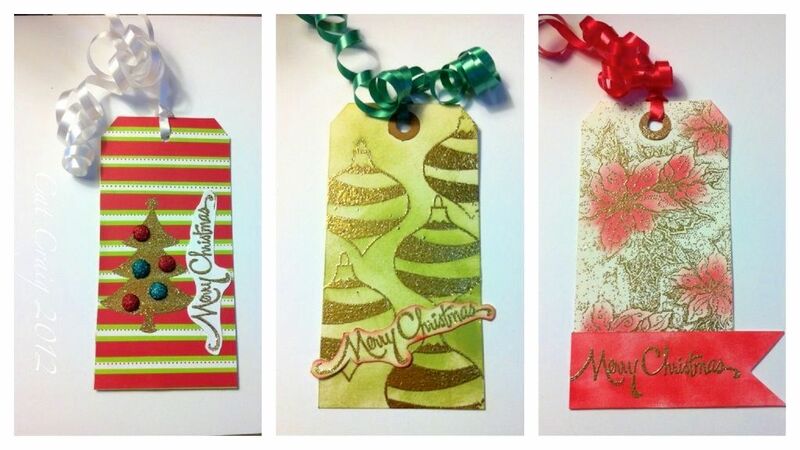 My favorites are the poinsettia tags. 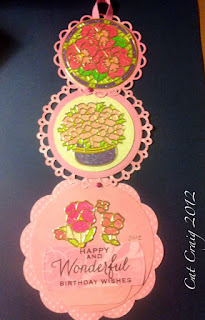 I stamped those in versamark, then embossed in either gold or silver, then sponged the flower centers with Barn Door distress ink. Thanks so much for taking a look. My last birthday card of the year goes to my MIL. Pink is her favorite color, and she likes glitter as much as I do. This is my first attempt at a telescoping card. I love how the card opens up and there is more and more to look at. 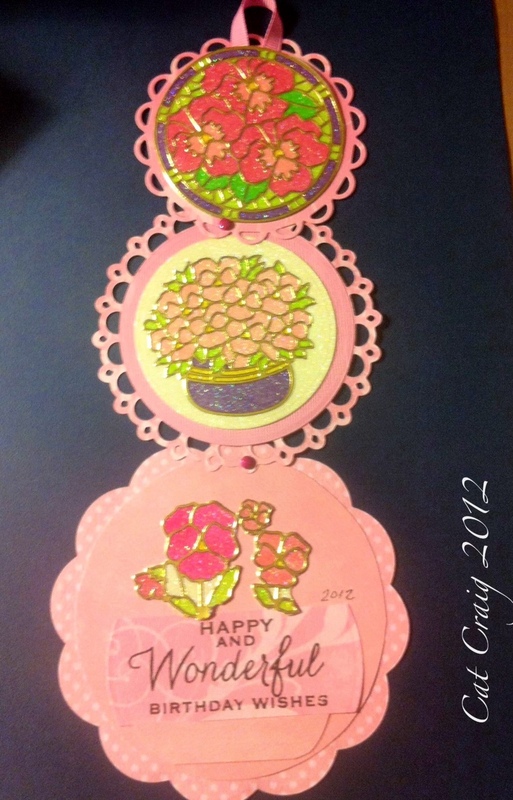 I used Bo Bunny papers, Copic Markers for coloring the glittered images, Starform flower outline stickers, glitter ritz in cool highlights, sookwang double sided tape sheets, doodlebug brads, JoAnn ribbon and several spellbinder dies. I enjoyed making this card, and I know my MIL loved the card too! Life is good. Hubs is here with me in California for the Holidays. We have been apart since October. I am so happy to see him again. We will be traveling back to the east coast after the holidays. 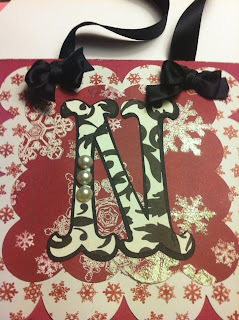 I have been crafting, but not getting blog posts done. This holiday hanger I made for my MIL. I thought she would enjoy the soft colors and the bit of bling in the middle. All shapes but the wreath were cut using my Cricut. Papers by S.E.I. Alpine Frost stack. 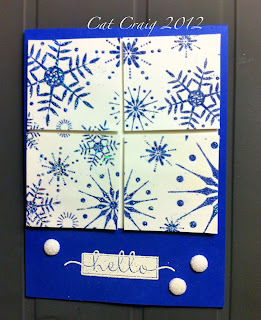 I love this snowflake stamp by Hero Arts. 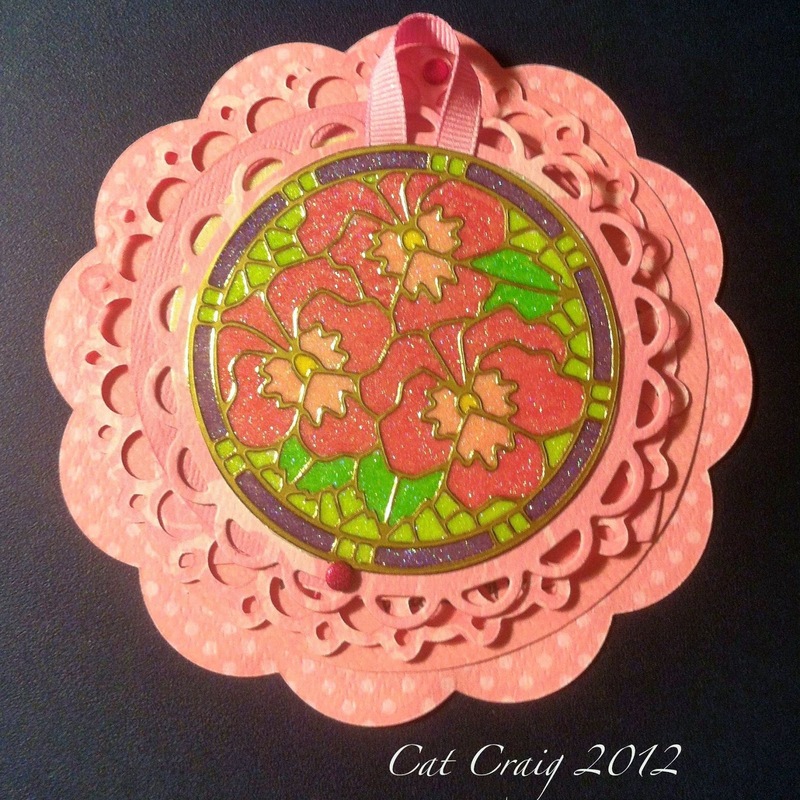 I recently received a lovely card whose focal point design I scrap lifted. You can see the original card here. I love the 4 squares, they make such a bold statement. I decided only to emboss the stamp on the squares, not to add any inking. I used a contrasting embossed sentiment at the bottom. 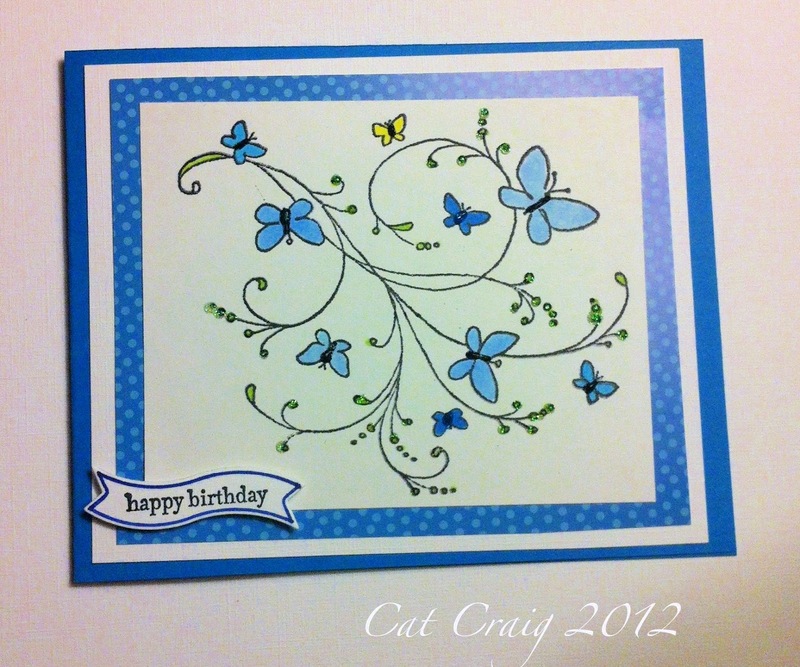 This card went to my card-making friend here in California. We have been exchanging 1 card a month for about 14 months now. Two of my friends share the same birthday. So I was busy this weekend making birthday cards. The first features Memory Box stamps, and some Bo-Bunny papers. The flowers were stamped twice, off-set. 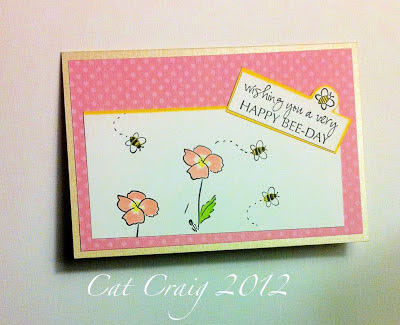 The bees were stamped 3 times on the card panel and once above the sentiment. Color was added with copics, and I used a micron liner to add the bee trails. 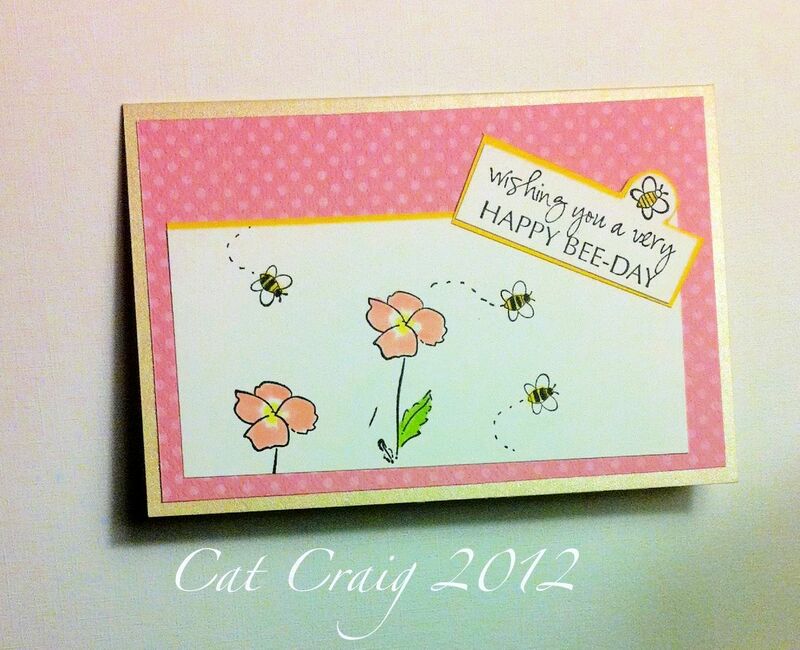 A tiny bit of yellow paper for added contrast was used to mat the sentiment and above the stamp panel. Another birthday this week. 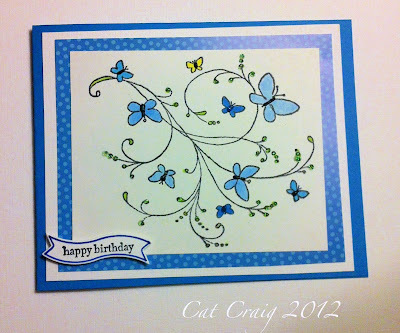 A simple stamped image, colored with copic markers, some stickles for a bit of sparkle. The sentiment was stamped then I used one of the Stampin' Up Bitty Banners dies to cut out the sentiment, before I took the paper out of the die, I ran a blue Zig marker around the inner edge. I like the extra zing that gave the small sentiment. I went to another crop with my best scrapping buddy on Friday night. She is amazing and puts together beautiful pages. She packs up her stuff and brings it all. I used to do that, but then I get hung up on what I didn’t bring and have a hard time finishing things. 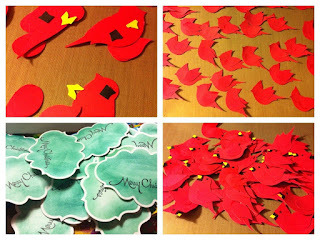 So now I get my projects together, make my die cuts and pick out papers ahead of time. When I get there I just have to put my projects together. Much more relaxing for me. I had lots and lots of projects this time. 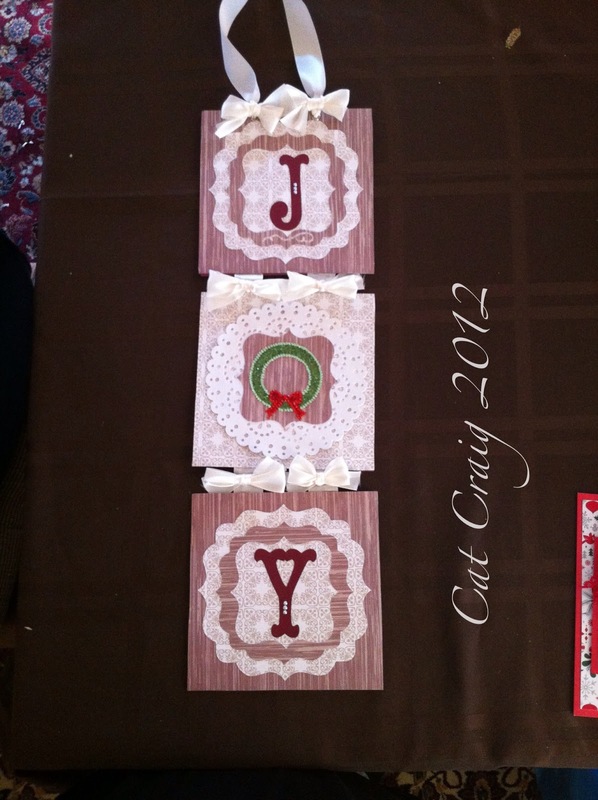 I made 3 holiday hangers, 8 cards, and 6 scrapbook pages. I was pretty happy with them all. 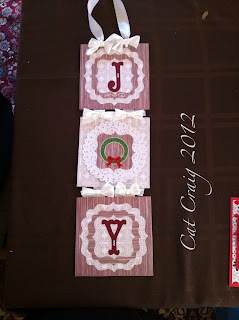 Today I am sharing one of the holiday hangers I made. It’s a little tough to photograph. I used chipboard, and paper, some ribbon, and some pearls. I love the modern look of the black and white graphic paper. I made two of these and gave my buddy one, but only after she raved about it. I had to make sure she liked it!